Academy Class 204 President Paul Lowrey graduated last night. 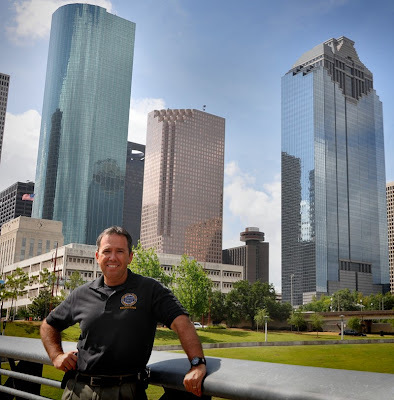 President Lowrey was one of the 66 newest members of the Houston Police Department. 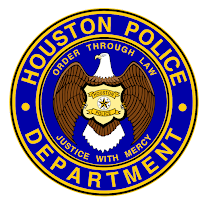 Starting this week they will be out on the streets protecting and serving the citizens of Houston. 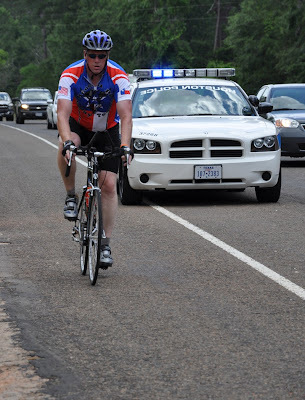 You can feel the pride in Officer Lowrey's comments. Way to go 204, make us proud! Academy Class 204 graduates tonight! Tradition held strong as Class 204 held their final roll call as the sun rose above the police academy this morning. Academy Classes 205, 206, and 207 watched Class 204 with pride, knowing that they too will soon be performing their final roll call. All the cadet classes will stand in formation during roll call and will announce their names one by one very quickly. Throughout training, roll calls are done the same way every time, every morning. However, on graduation day, such as Class 204, it is done a little differently with each cadet of Class 204 slowing down and pronouncing their name loudly and proudly. Congratulations 204, make us proud. Mr. Bookman would have made a very good cop! Academy Class 203 graduated on June 16, 2009. Cadets Vashawnda McLean and Kevin Waymire from Class 203 performed the National Anthem preceding the ceremony. Click the play button above to listen to their wonderful rendition. Now that they are police officers on the street, I wonder if they sing to the crooks to calm them down? 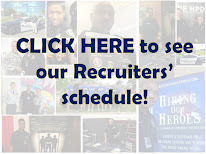 Academy Class 204 graduates next week! 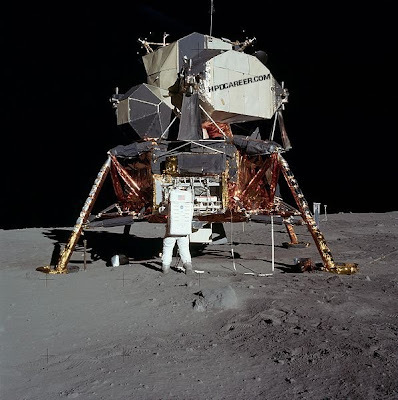 The Apollo 11 mission was the first manned mission to land on the Moon. 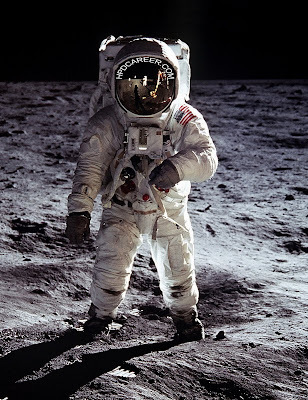 On July 20, 1969 Neil Armstrong and 'Buzz' Aldrin became the first humans to walk on the Moon, while Michael Collins orbited above. 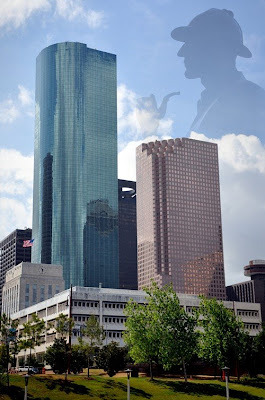 Houston, once known for our oil industry, was forever changed when NASA came to town. 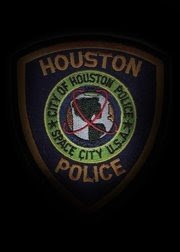 The patches worn on our uniform still reflect the words "Space City U.S.A."
For a free recruiting T-Shirt, what year was this photo taken of the "then" brand new police officer graduating from the police academy? 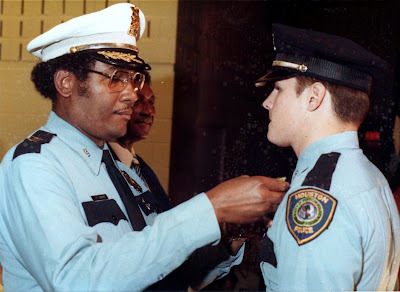 For a bonus gift, who is the officer receiving the badge, and who is the Chief of Police pinning the badge on the officer? Fellow officers, please do not reply. Cadets, applicant's and fans of the blog, the first one to comment in the comment section will win the shirt and the bonus gift. Please leave your email address in the comment section. I will not post the comments until Monday, so the suspense will fester as to who answered first. 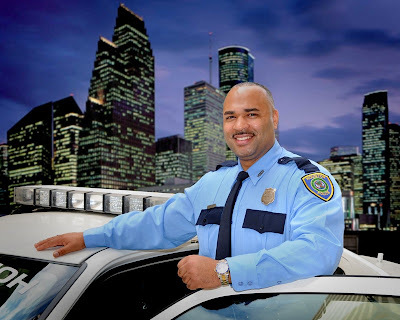 When you become part of law enforcement and join a police department, you become part of an extended family. Occasionally, as part of a family, you will have disagreements and a few fights along the way. The only thing I can think of that would cause "police family" to fight is shown on this video one of my readers sent me. It seems that the trivia questions that I post have become as popular as the free t-shirt you win for getting the right answer. I have been receiving many emails lately wanting to know when the next trivia question was coming. Wait no longer. 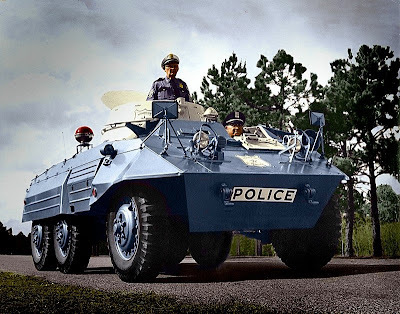 What year was this photo taken of the "then" brand new HPD Armored Car. The first one to comment in the comment section will win the shirt. Please leave your email address in the comment section. I will not post the comments until tomorrow, so the suspense will fester as to who answered first. I had the pleasure of meeting Wonder Woman yesterday at the Police Academy. Cadet Ana Andino from Academy Class 204 graduates at the end of this month. Crooks, I suggest you comply. Way to go Cadet Andino, we are proud of you. 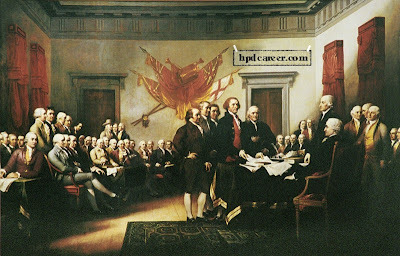 I hope everyone had a nice Fourth of July weekend celebration. Now it's time to run all that barbecue and potato salad off. At least it is ten degrees cooler this morning than it was yesterday. 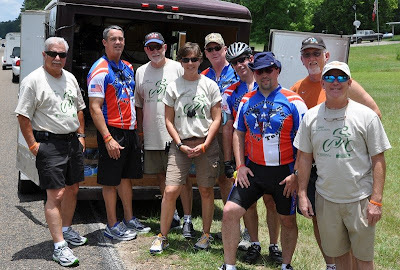 HPD Bike Relay Team does it again! 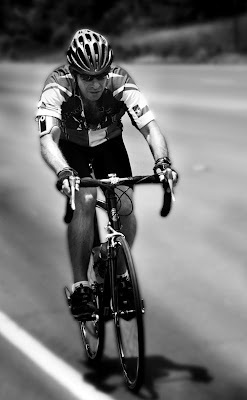 Leukemia is the no. 1 child killing disease. 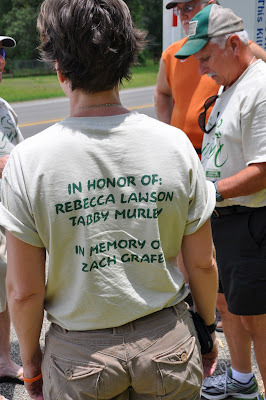 Ten times as many adults as children are stricken with leukemia. Lymphoma rates have nearly doubled since the 1970's. 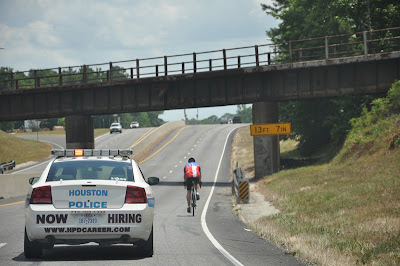 Police officers always want to "catch a killer" and the Houston Police Department (HPD) Bicycle Relay Team's goal is to "arrest these killers" and accelerate The Leukemia & Lymphoma Society's fight against blood cancers. 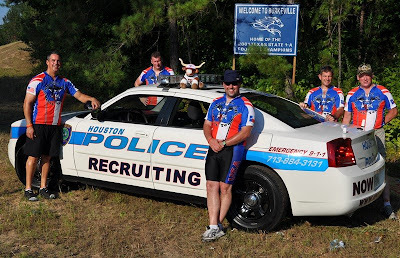 The Houston Police Bicycle Relay Team began their 1,800 mile bike ride in Houston and ended five days later in Providence, Rhode Island, travelling through the Smoky Mountains, crossing the Mississippi River and finally to their destination on the east coast. 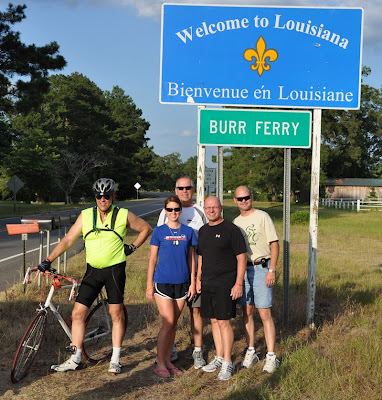 This was an unparalleled volunteer effort to raise funds for The Leukemia & Lymphoma Society. 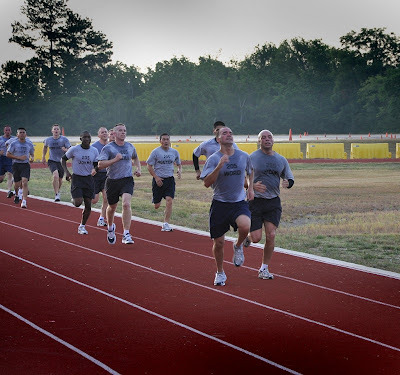 After six months in the police academy, Class 203 graduated on June 16, 2009. As you may imagine, the pressure of finishing and getting the badge pinned on their shirts, boils down to the final day when it actually happens. I like to film a little piece I call "Pressure Relief!" 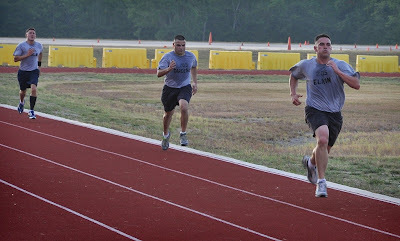 It's a chance to have a little fun with the graduating cadets after six months of intense training. As usual the cadets obliged.